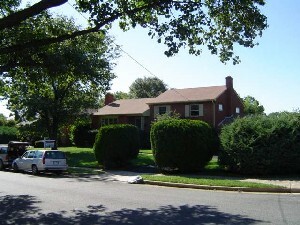 Originally, the yard was an overgrown jungle. When the moving truck hit one of the bushes at the edge of the driveway, weakening it so that it fell over in a windstorm, we decided to take out all of the offensive bushes (we're still working on the ones right in front of the house). We literally got thank you notes from neighbors for removing such an eyesore on the corner. We are now in the process of trying to grow grass in those empty patches. 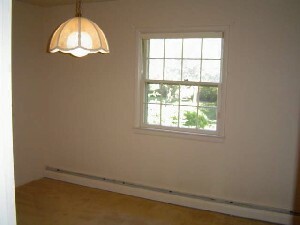 As you tour the "before" house, It's evident that beige paint was on sale and that they had access to a paint sprayer. Enjoy the tour and, as always, we've saved the pink bathroom for last. 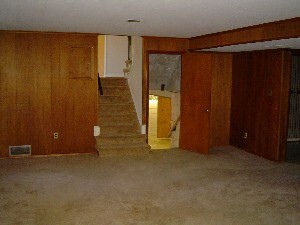 The living room had beige walls, beige trim, beige ceiling, and beige carpet. 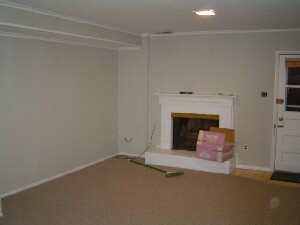 We opted to keep the beige walls but painted the ceiling, trim and fireplace white. 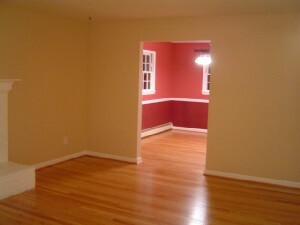 We also removed the carpet to show off the well-preserved hardwood floors underneath. After a visit from the Johnsons, who travel with a sewing machine, we acquired curtains and a specially-made window seat. 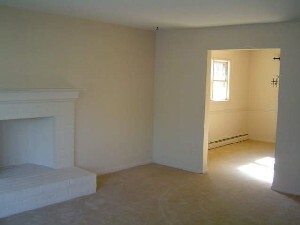 Before (above left)... After (above right)...Furnished (below)! 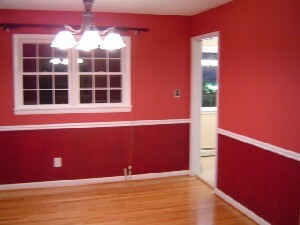 The Dining Room comes next. 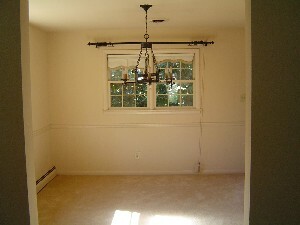 It, too, was beige from ceiling to floor and everything in between, including the chair rail! The scary medieval chandelier didn't do the trick for us, either. Aleck didn't think the colors would work, but, like everything else Stacey suggests, it turned out better than expected. Breaking from the beige for a bit was the kitchen, which was lots and lots of textured yellow. 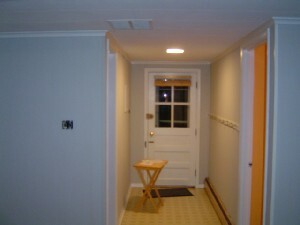 The walls and ceiling were covered with yellow wallpaper (ceilingpaper?). It went well with the yellow countertop (which we have yet to get rid of). 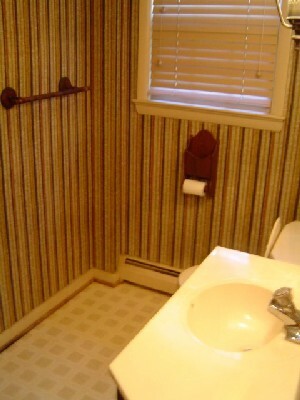 The forward-thinking former occupants were kind enough to put up wallpaper around the house that peels away from the wall without needing to use special tools or steaming. It's a very considerate thing when you consider how ugly the paper was. 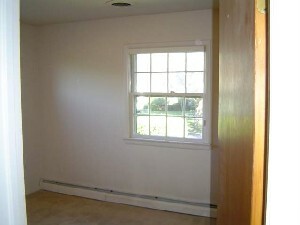 The trim on the baseboards and windows look white in these pictures but were really beige. Check out the navajo orange,brown and yellow woven shades. *Shudder* They were one of the first things to go, followed closely by the light fixture. We painted and added a pot rack (one of Stacey's dream items). We have preserved the vintage 60s-era intercom/radio although it doesn't work anymore. 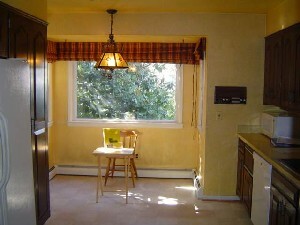 There are not a whole lot of places you can go with bright yellow countertops and dark brown cabinets. We went for a greenish/yellow theme (you can see above that the breakfast nook is a yellowish color). 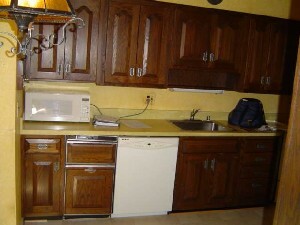 But we were able to replace the cabinet hardware, which made a big difference. How do you like the camouflaged trash compactor to the left of the dishwasher? Neither do we. It doesn't work anymore, either, so we will be getting rid of it one day along with the countertop. It's heaven made out of wood. Sure, it looks cool. But you haven't seen the best part about it. Are you sitting down? Yes, that's the entire set of shelves swinging out! And opening to reveal ANOTHER entire set of shelves behind it! And ANOTHER set of shelves on the back! And the left side does the same! (And yes, that's Spiedie sauce on the bottom right.) Stacey would live in there if it were socially acceptable. One day when we have the energy again we will repaint it a clean white, but we haven't gotten there yet. 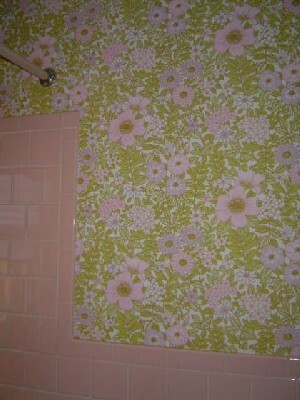 The Pink Bathroom is also on this level, but you'll have to wait until the end to see those pictures. First we come to the "sewing room" as Aleck dubbed it. 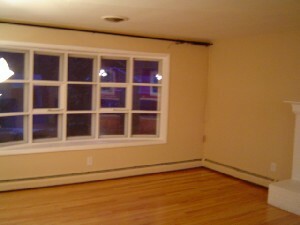 It began with beige walls, ceiling, and trim. 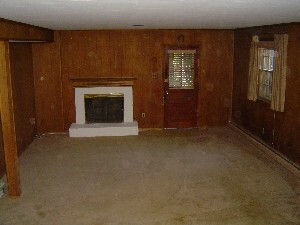 Of course, it has beige carpet. 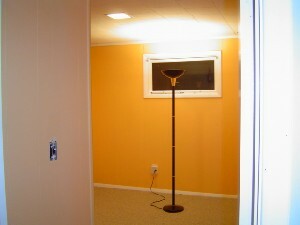 We painted (floor to ceiling) and changed the light fixture to turn it into "the yellow room." Now that it has a bed, it is "the guest room." Guests will love the high speed internet connection that comes with each night's stay at our hospitable establishment. 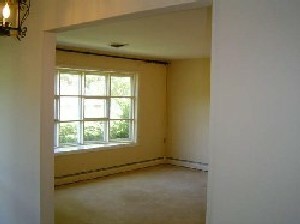 The other spare bedroom also had beige ceiling, walls, trim and carpet. 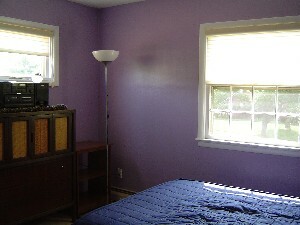 It, too, was painted and is now "the purple room." Our very generous former neighbors moved (and downsized) and gave us a bed for this room, so now it can serve a purpose aside from housing Stacey's wedding dress in the closet. 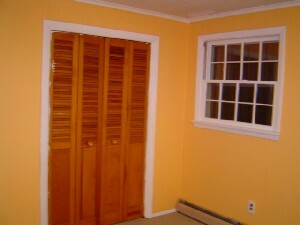 Both the purple room and the yellow room came with really nice, fairly expensive custom made window shades which, as you may have guessed, are beige and don't with go with the new decor. 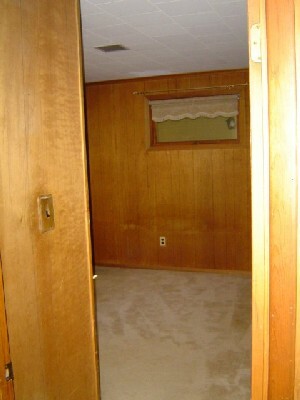 The upstairs carpet is still beige, though, so the curtains at least match something. 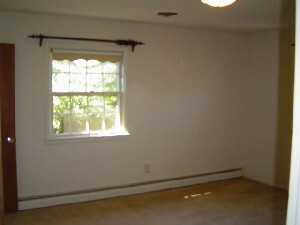 Once again, beige all around (and complete with scary curtain rods). We painted the room light blue, which was a wise choice given that the master bath is also blue (meaning that the floor tiles, wall tiles, sink and toilet are all blue. At least the walls were white. 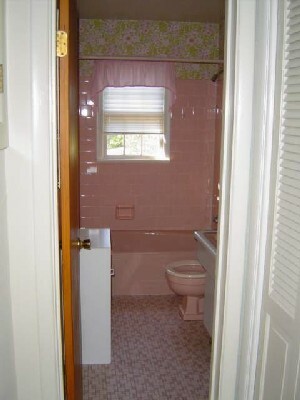 Wait until you see the pink bathroom). The carpet is not really blue-- the picture just came out that way. It was, surprise surprise, beige! 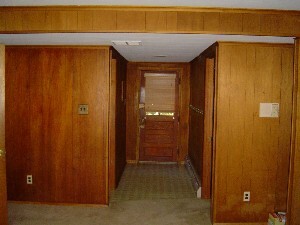 The downstairs level was made up almost entirely of wood paneling and wooden accents like light switch plates and horseshoes over the door. Since we discovered that there are nothing but studs behind the panels, we had no choice but to paint it for now. It started off looking like a complete dungeon but we managed to brighten it up a bit with light grey walls and white trim. 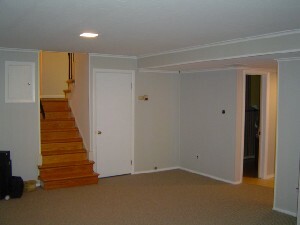 We also replaced the beige carpet with a light gray and white blend. 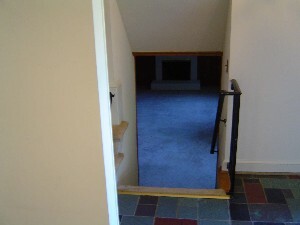 That door leads down into the unfinished basement, which is where we have the washer/dryer, extra freezer (that came with the house!) and lots and lots of storage. 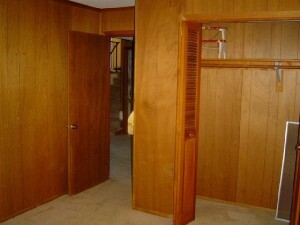 It, too, was wood paneling and Aleck chose a bright, mango-like shade of orange for the walls. He also got rid of the frilly curtain. From the inside of the office looking back out (the closets and doors are a project we will undertake this summer and will turn them all white with spray paint). This bathroom was very scary, indeed. 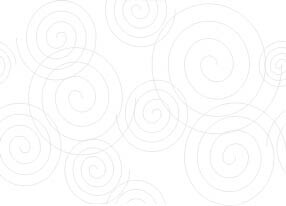 It is small and oddly shaped, with corners and edges jutting out everywhere. The striped wallpaper really made it hard to keep your balance in there. Yes, this is really in our house and is probably the sole reason we were able to buy this house as quickly as we were (because all other potential bidders were scared off by this). 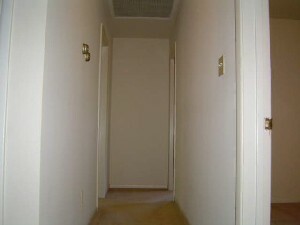 American Standard runs a contest every year to find "America's Ugliest Bathroom" with the winner receiving a makeover. We entered our Barbie-explosion monstrosity, but somehow we didn't even make it to the regional finals. Incredible!